Experience the peace and serenity of a forest created thousands of years ago and virtually untouched since the last ice age. This easy going well defined track is ideal for a family walk. The track starts at the Routeburn shelter carpark and follows the main Routeburn Track for a short distance through beautiful red beech dominated forest. On this moderately paced walk your friendly guide will point out some stunning examples of native plant and birdlife. 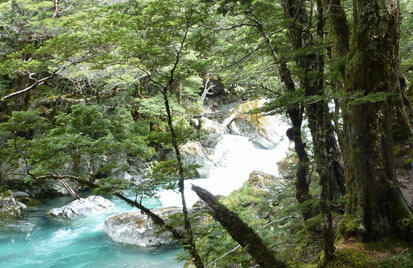 Enjoy the blue-green waters of the Routeburn River and the surrounding snow-capped peaks. This is an easy well defined track suitable for all fitness levels.